Free PDF Creator helps Print Web Forms Free PDF Creator helps Print Web Forms – MillionClues! I prefer software’s that are build to do just one job rather than the ones that can do a lot of chores. I love software’s that come free. doPDF is my free and simple PDF Printer of choice. doPDF weighs 3.72 MB, comes with a clean installer. Like every other PDF Printer, it shows as a printer in your list of printers. Here is a screen shot of how doPDF looks like in action. To save web-forms, fill them up and then print the page from the File menu of the browser using the PDF printer. 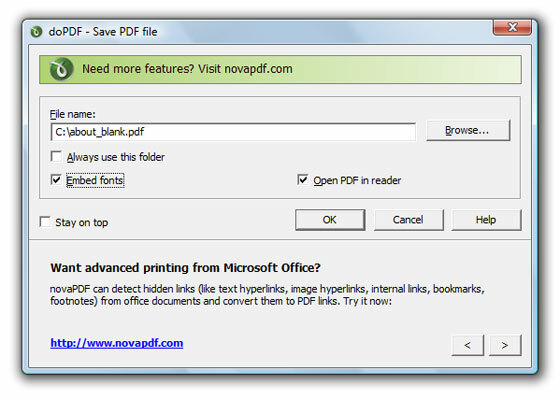 As you might have guessed from the screen shot, novaPDF is a pro version of doPDF with added features like merging PDF files, adding water marks, compressing PDF files, modifying the document properties (from the Change Options menu) and creating printing profiles. Honestly, I don’t think ‘most‘ of us would ever need any of those features. But if you need them head over to Digital Inspiration for a free, but a stripped down copy of novaPDF. Both doPDF and novaPDF works on both 32-bit and 64-bit systems. Glad! I guess the pro version have that feature (not the limited release from DI). yes, you right and i’m very happy find this article, the link PDf is so awesome i like it ..
‹ Making Money Online Still a Good Option In India?